Inspired by a venerable Pacific Northwest Indian barbecue technique, grilling on cedar planks is one of the best ways around to cook seafood. Planks are 14″ x 7″. 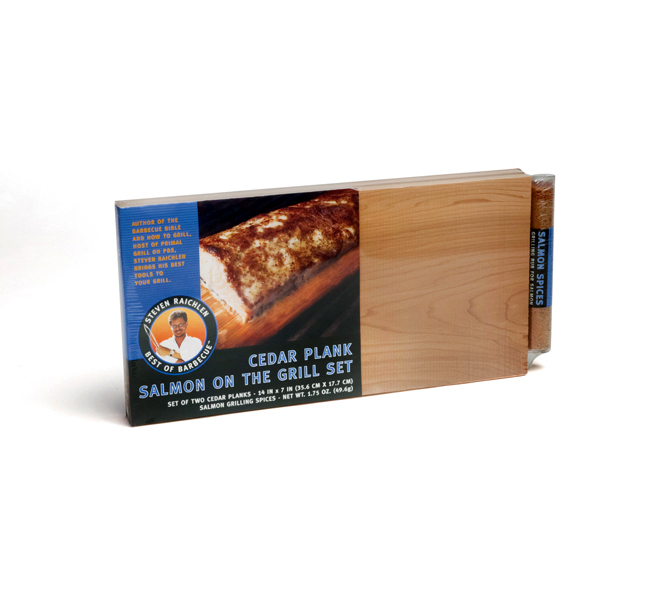 The moist plank imparts a haunting cedar flavor. More practically speaking, it eliminates the risk of the fish sticking to the grill grate or breaking when you turn it. Plus, it makes a great presentation, especially when you serve the fish hot off the plank. Set of two, comes with a tube of Steven’s herb rub. Soak the plank in cold water to cover for 1 hour to release the cedar aromas and keep the wood from burning on the grill. Drain well, lay the fish with seasonings on top, and indirect grill until fish is cooked. The planks can be reused several times – simply soak, scrub, and dry until the next use. Once edges are too burnt for grilling, break the planks into pieces, soak well and toss onto the coals for smoking. Use only 2 to 3 teaspoons of spice rub per pound — a little goes a long way!